Shop the Rewined Signature Collection and enjoy handcrafted candles with fragrances that are carefully blended to mimic the flavors and aromas found in your favorite varietals of wine. Rewined Candles does every step of their candle-making process by hand while using the richest ingredients available. The Signature Collection candles are made of 11 oz. of hand-poured sox wax. Each candle is handcrafted from a repurposed wine bottle in Charleston, South Carolina. Cabernet Rewined Candle - 11 oz. Champagne Rewined Candle - 11 oz. Chardonnay Rewined Candle - 11 oz. Merlot Rewined Candle - 11 oz. 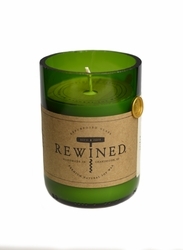 Pinot Grigio Rewined Candle - 11 oz. 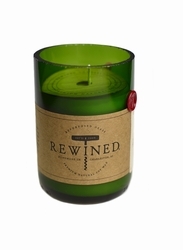 Pinot Noir Rewined Candle - 11 oz. Riesling Rewined Candle - 11 oz. ~Sangria Rewined Candle - 11 oz. Sauvignon Blanc Rewined Candle - 11 oz. *Wine Under the Tree Rewined Candle - 11 oz. *Spiked Cider Rewined Candle - 11 oz. Fresh apple, cinnamon, clove, and buttery dark rum.